The IGFA has just released another round of potential all-tackle and all-tackle (length) world record catches. Keep in mind that these catches are currently undergoing the approval process, and as of yet are not officially considered to be world records. On Nov. 16, Andrey Pedchenko was fishing Thailand?s Ratchaburi Lake when he landed this behemoth of a redtail (pirarara) catfish. 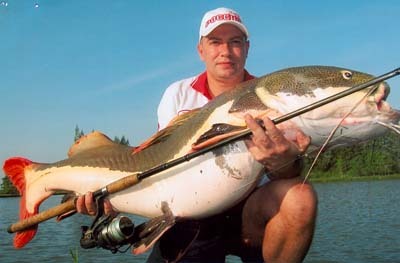 Pedchenko used a piece of a fish fillet to catch the fish, which measured in at 124 cm. In the waters off of Isla Coiba in Panama on Nov. 25, Jean Paul Estradere landed this Pacific cubera snapper, using a Sebile Splasher. The snapper measured an astonishing 115 cm. On Nov. 28, in Laos?s Luang Prabang, Dale C. Fischer landed a potential all-tackle world record lagleri barb. It weighed in at 2 lbs, 7 oz, and measured in at 34 cm. The barb was caught using rice husk flour. Gavin Clark was also fishing in Laos on Nov. 29, on the Nam Song River, when he landed a stracheyi mahseer that weighed 9 lbs, 14 oz, and measured in at 63 cm. The fish was caught on a Lucky Strike Pointer and is a potential all-tackle record. Regular readers of this article will recognize Maureen Klause. She?s back again, this time with two new potential all-tackle (length) record catches. The first is a blue fish that measured in at 78 cm, and the second is a striped bass that measured in at 108 cm. She used a bunker chunk and a bunker head, respectively, to land the fish in New Jersey?s Delaware Bay. Finally, Paul E. Tulgetske was fishing in Michigan?s Pentwater Lake on Dec. 4 when he landed this beautiful rainbow trout. It measured in at 75 cm and was caught on an X4 Flat Fish. More record catches can be found here.